What is forex candlestick chart? The kind of chart we are interested in is the Candlestick chart. It’s the easiest to read and the nicest to look at. It’s the most user friendly and this is the one 90% of Forex traders use. Forex Candlesticks are the individual boxes you see (Real Body or Body). Some of them have a thin line protruding from the top and/or the bottom (Wicks or Shadows). You can see that there are 2 different colors, red and blue. Originally, there were only white and black, but with modern technology, we are able to color them as we like. Each candlestick tells a story. 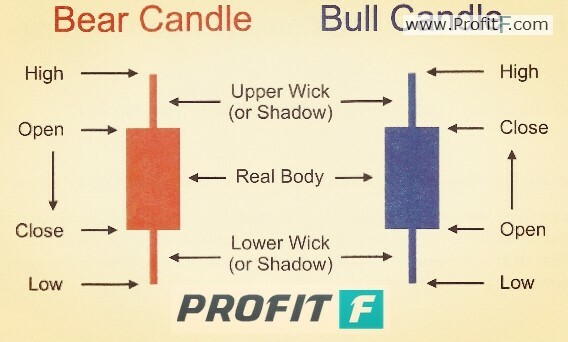 There are 4 components of a Forex candlestick. The image above shows 2 candles, each a different color. Each Candle is composed of the same 4 elements with one exception, the red candle has the close lower than the open while the blue candle has the close higher than the open. Each candle takes a period of time to build. This amount of time is reflected on the timeframe of the chart you are using. A 4 hour chart means that a candle takes 4 hours to create, a 15 minute chart means each candle takes 15 minutes to create. When a Forex Candlestick is built, it starts with the open level, this level remains exactly where it starts. Through the course of the creation of the candle, price will bounce up and down making a high and a low and then finally finish with the close. The close completes that candle and then a new candle starts with the open, almost always in the position of the close of the previous candle. A Forex Candlestick that closed higher than it opened is blue and a candle that closed lower than it opened is red. Traditionally, a bull candle was white and a bear candle was black.